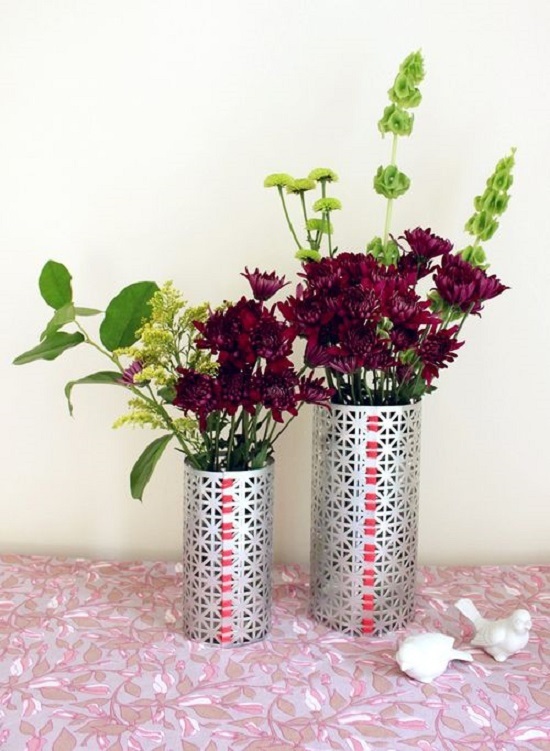 Beautify your home with these DIY flower vase ideas we’ve collected from all over the internet! 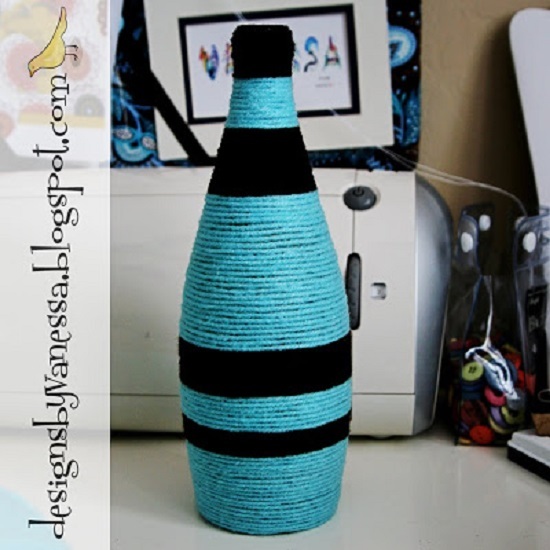 For a colorful vase with tons of texture and character, try this DIY. Here is the asymmetric arrangement of pretty hearts doubles as the perfect home for your floral keepsakes. 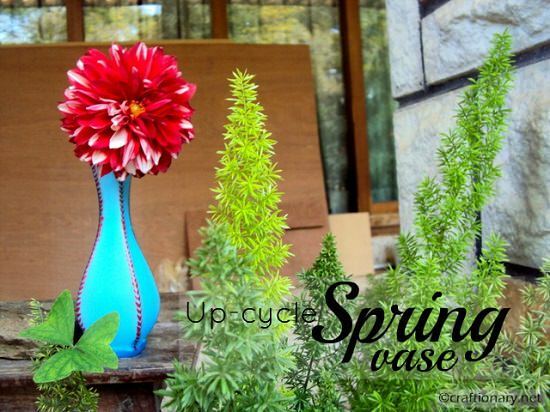 Gather basic shapes of containers and glaze them up with paint and paper for an array of colored vases. Learn how to make it here! 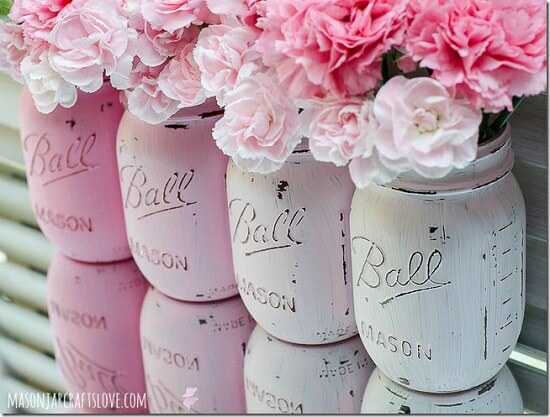 The fading dark contrast of these vases creates a dreamy look that goes well with your flowers. Here is the DIY. 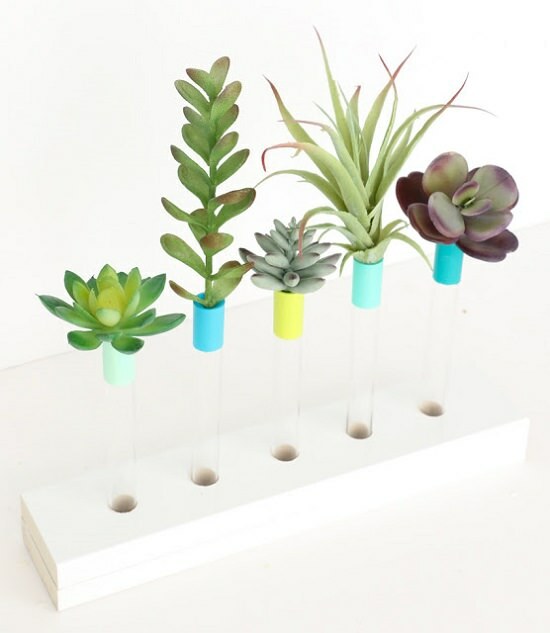 If you want to combine scientific elements with natural beauty, consider making vases out of test tubes with this DIY. 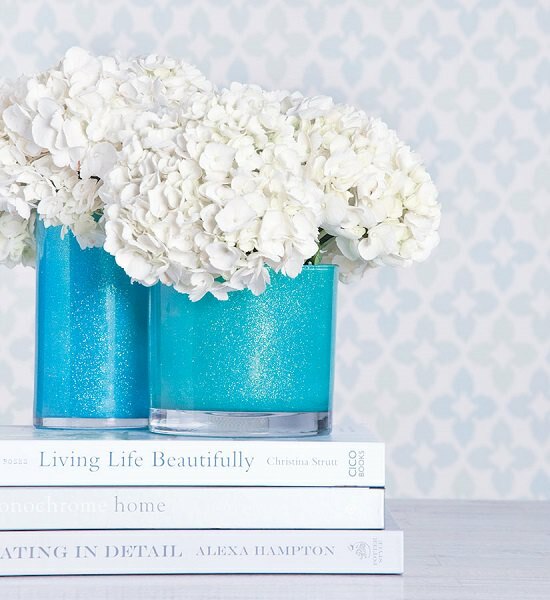 This polka-dotted vase is hassle-free and gets done in a dollar. Just follow this post. Lend some mortar sheen to an old box with foam blocks for an urban look. The DIY is here. Sometimes, few coats of bright paint are enough to revamp boring disposables. DA detailedpost is here. 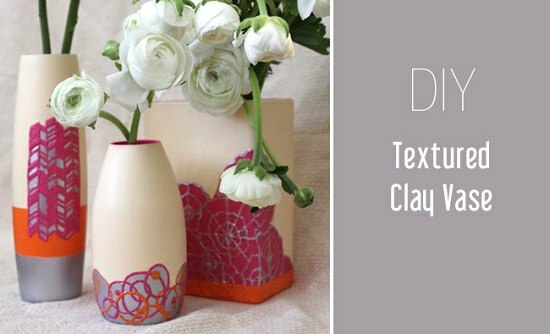 These DIY textured clay vases are proof that you can have color and texture in one combo! 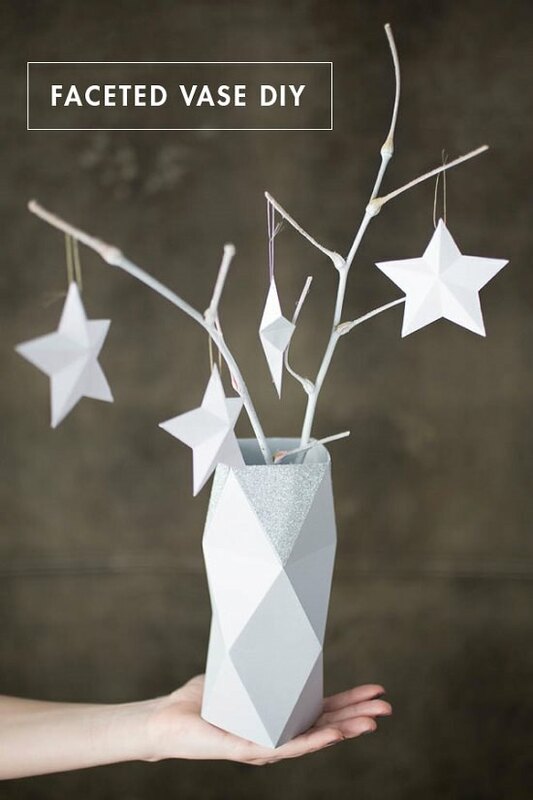 This simple DIY on craftionary shows you how to revamp tabletop essentials with metallic paint and glittery glaze. 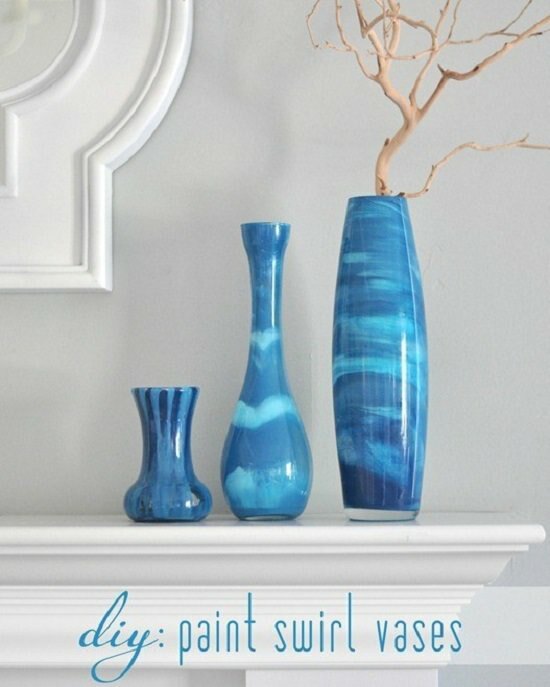 DIY paint swirl vases are perfect for adding a dash of color to the mantel. Fresh flowers wrapped in brown paper bags give a rustic feel to your home. Follow the instructions here. 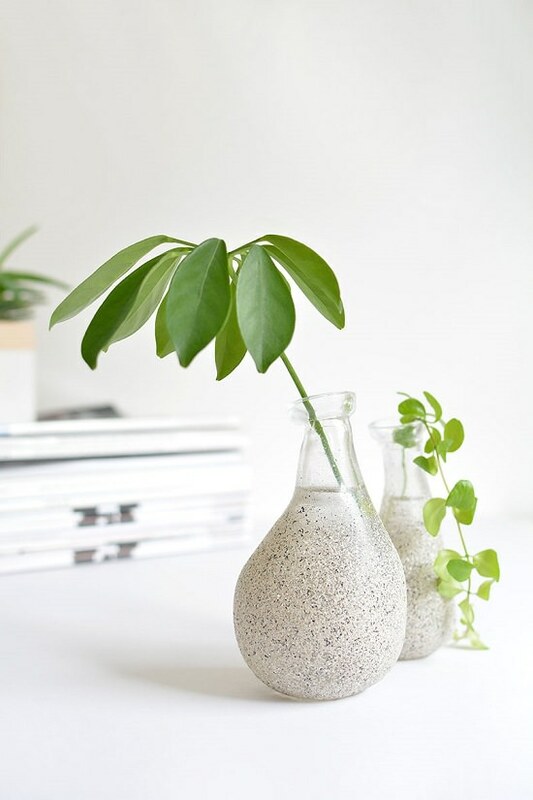 If you have leftover bottles and leftover paint, combine them both to make a stunning set of vases that will last a while. Here‘s is how to do it! 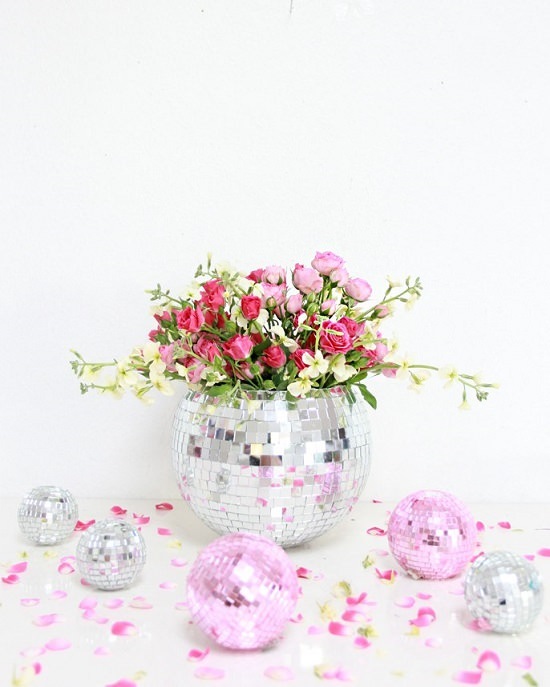 This disco ball vase is the reason we say flower and glitter go hand in hand. The detailed tutorial is here. 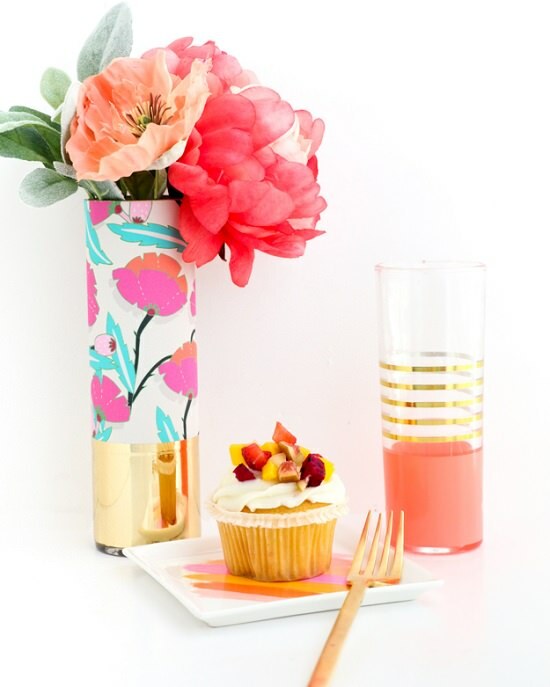 This fruity floral decor is perfect for a summer-themed party. We found the idea here. 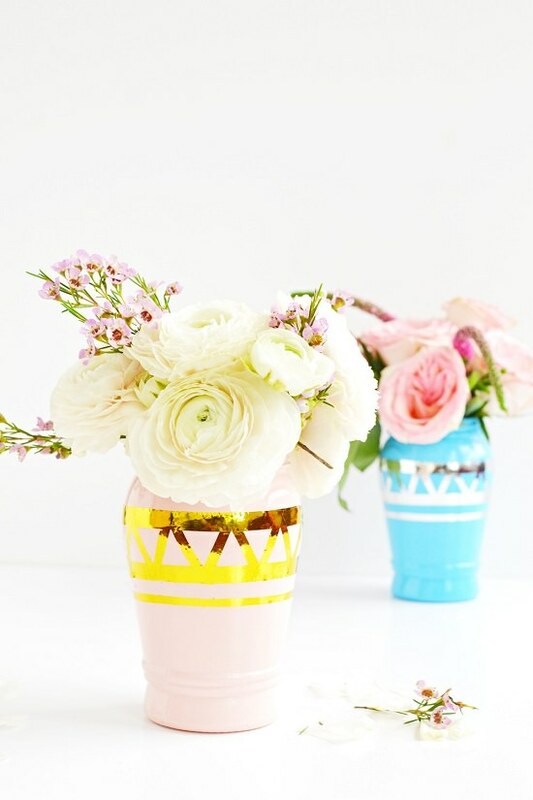 If you have empty perfume bottles that are too pretty to discard, fashion them into free-of-cost vases instead. Check out this post for details! 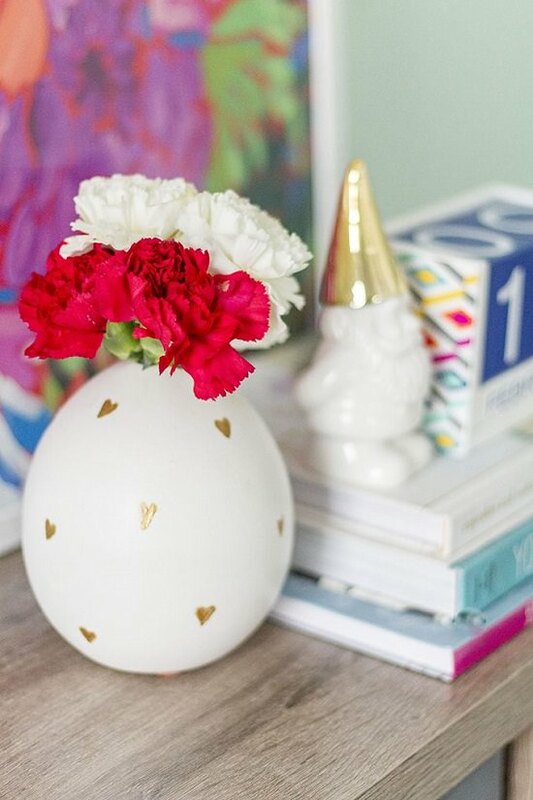 Creating a low-cost replica of the heart-themed vases at the stores is easier than you think! Click here for the instructions. This outdoorsy acorn vase deserves a spot on your garden table. Make it by following these instructions. 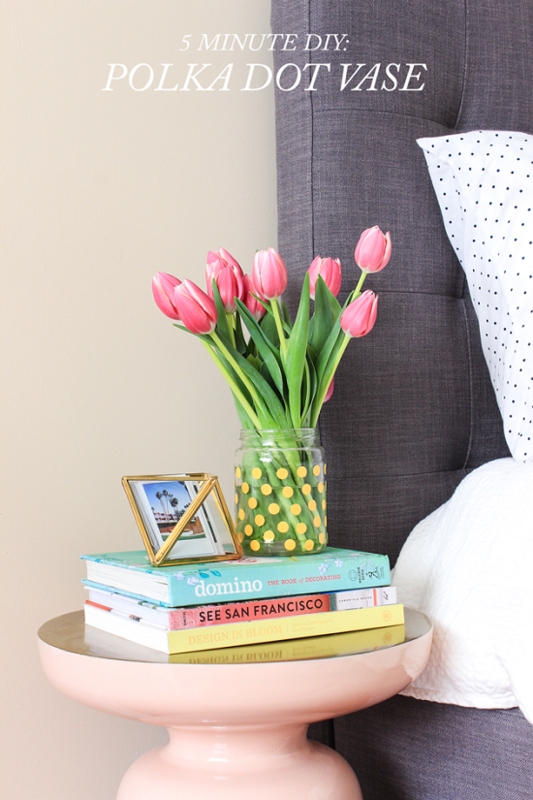 Here‘s a no-fail DIY vase idea that almost never goes wrong. 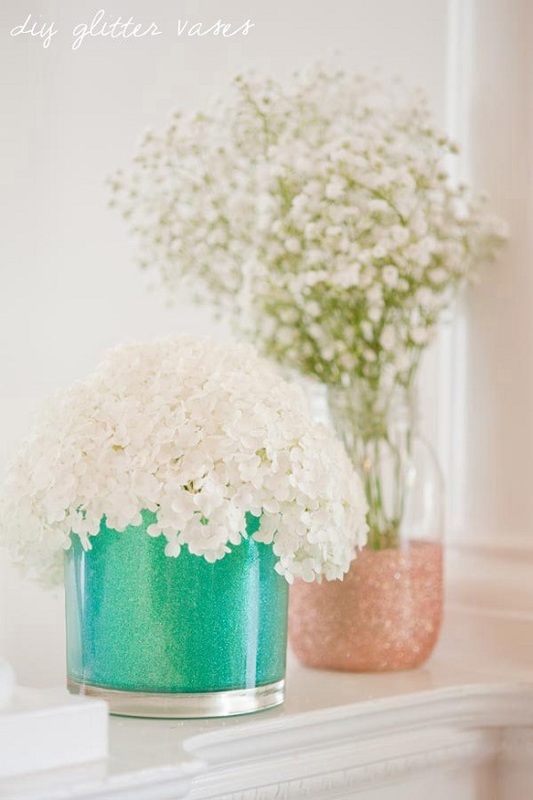 Brighten up an ordinary floral arrangement with a wee bit of sparkle. DIY for it is here. 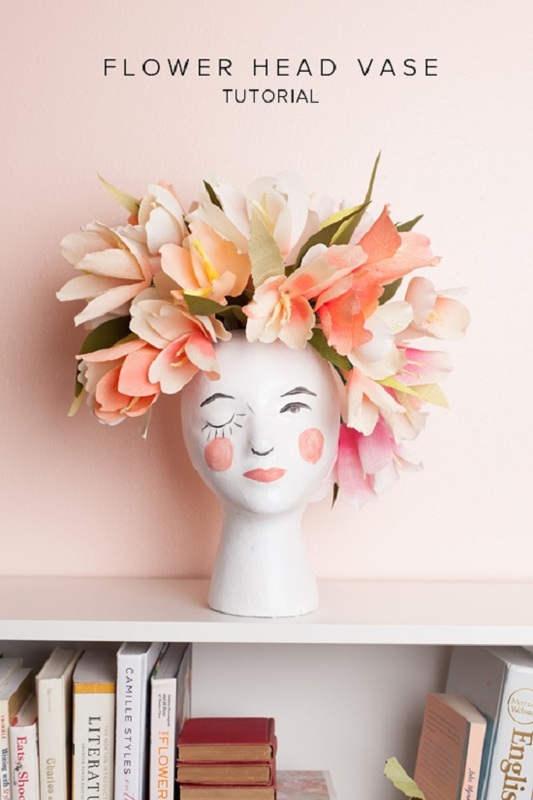 If pink is your idea of beauty, we suggest you try this DIY. 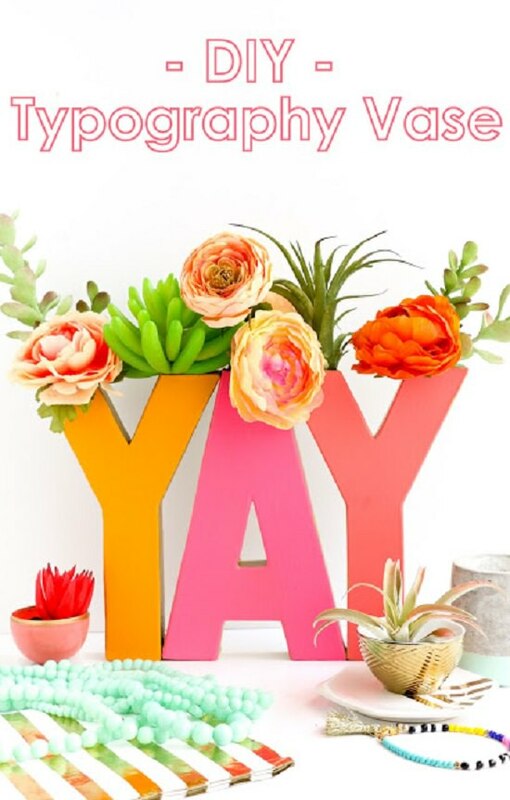 This charming typography vase can be customized to spell out anything and fit in with any color scheme. 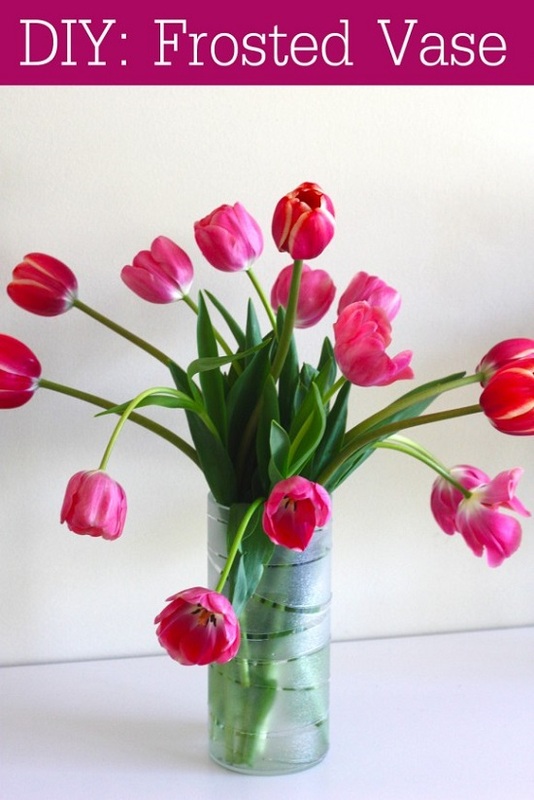 Revive old floppy disks back to life with this unique vase DIY. Visit brit for the DIY! 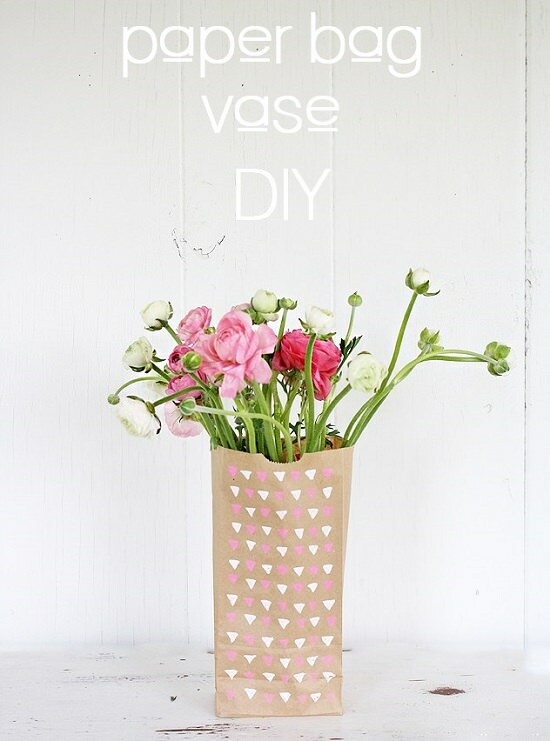 This paper vase is easy to make and you can tuck it into glass anytime for a fancier look. Get more details here. 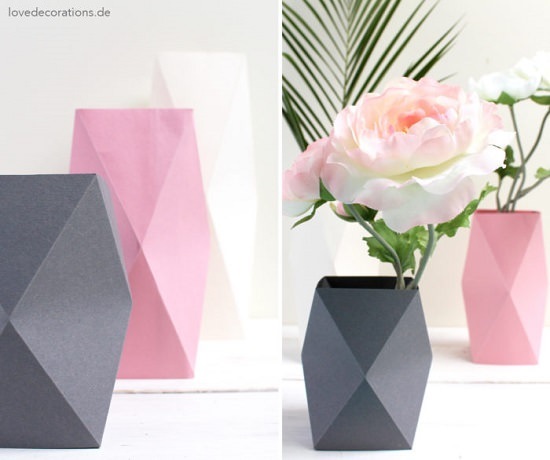 Create striking color contrast on plain vases with spray paint and contact paper. For the DIY, click here. 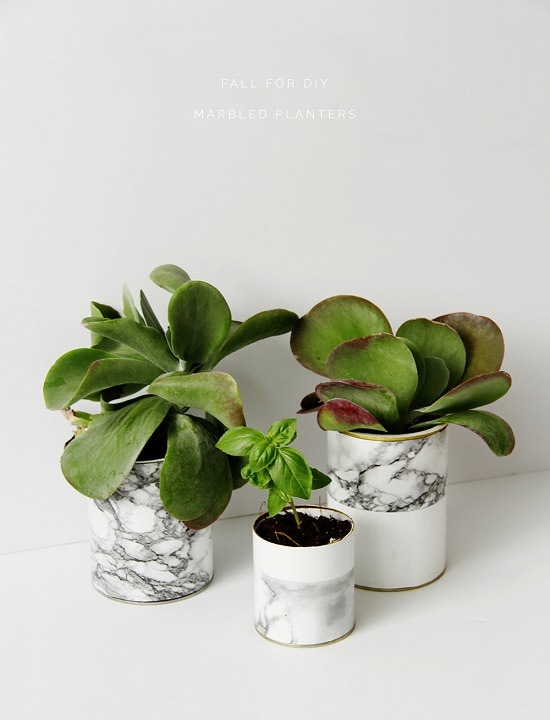 The supple marble finish of these vases makes it perfect for displaying foliage plants. Follow this DIY to make it. 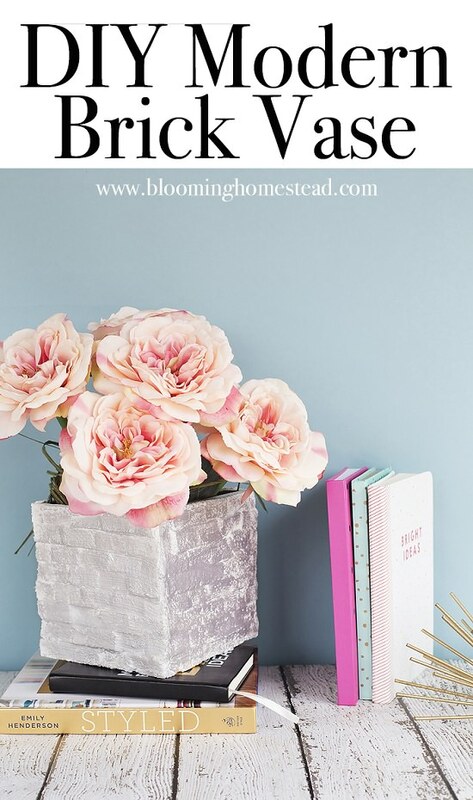 If you have a favorite vase that is now old and ugly, this is an excellent way to add some textural detailing and mask faded spots. Check out this DIY! 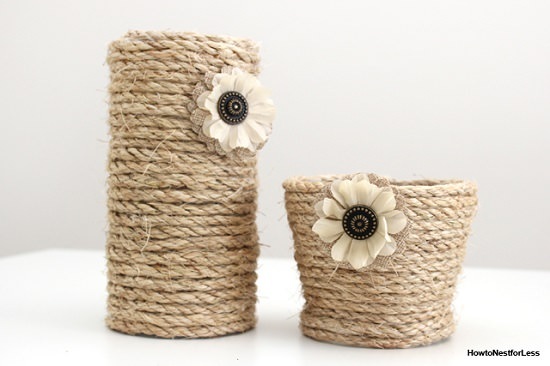 For a rustic mood that goes with your flower decor, consider this DIY rope vase. 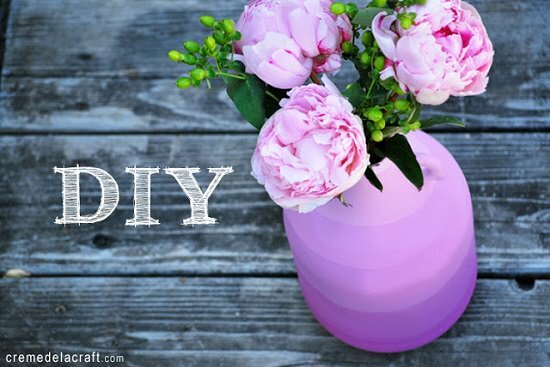 Convert thrift store finds into dazzling flower containers in less than an hour by following the steps here. This vase mixes soft and hard elements to create a unique contemporary look to match with your decor. A beautiful mess came up with this idea! If you want a vase that doesn’t take away from the showy appeal of your blooms, consider this one. Get inspiration from here. Here‘s an exciting flower carrier to break the monotony of books on your shelf. 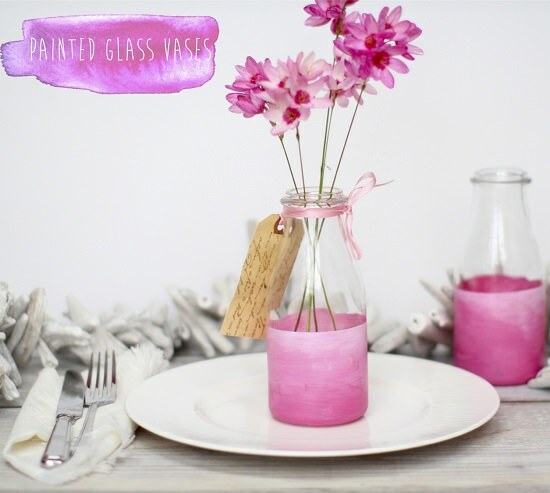 The subtle ombre effect of these spray-painted vases is hard to miss. Follow the step by step tutorial here. 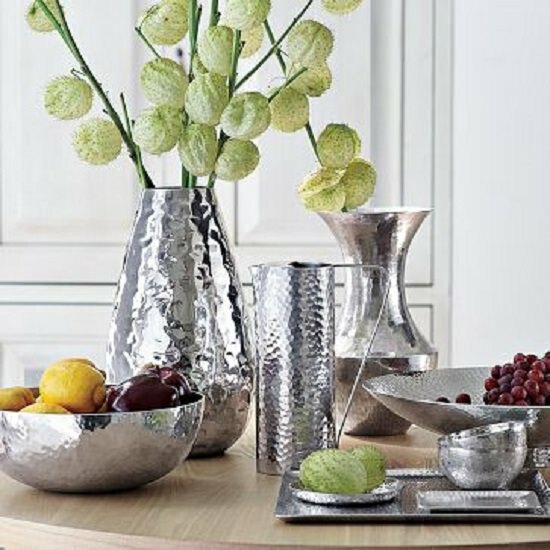 Shimmery mason jar vases are the perfect nice focal piece for adding sparkle to your dining room table. Click here for the DIY! 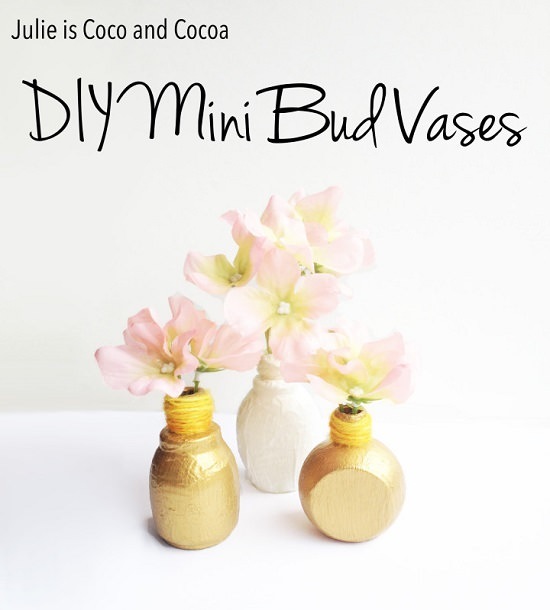 This DIY copper vase is just what you need to create contrast with your petunias. 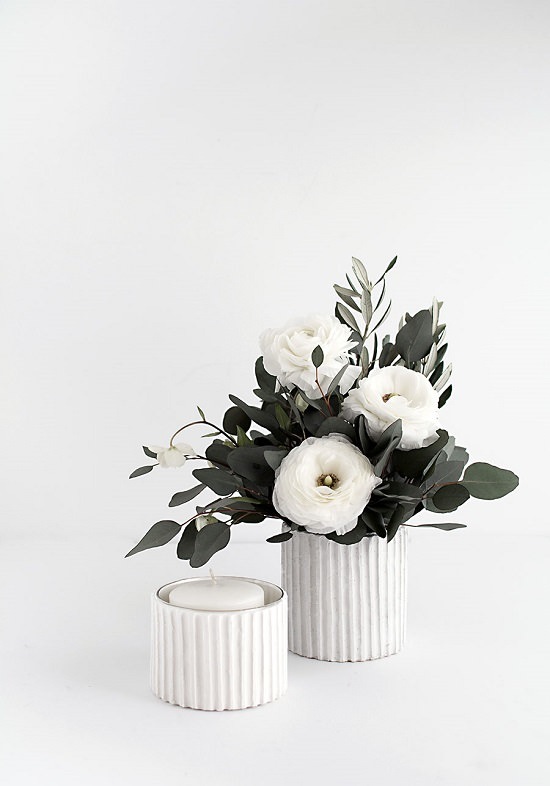 These tiny vases give you the chance to upcycle empty makeover containers while creating a home for handpicked flowers in the process. The simple steps are here. 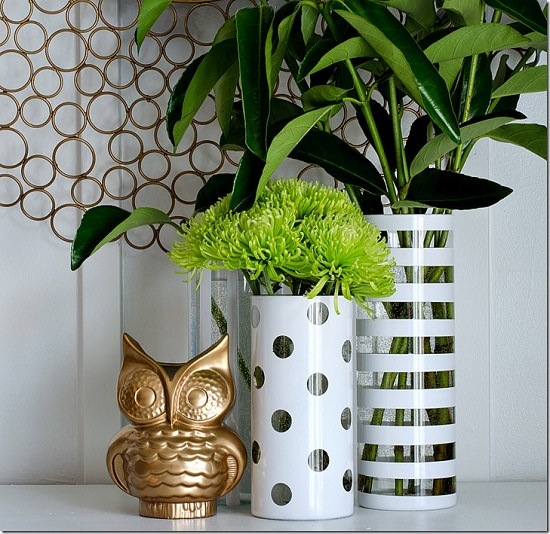 Bring a touch of bling to your tabletop with this easy-to-make DIY gold gilded vase. 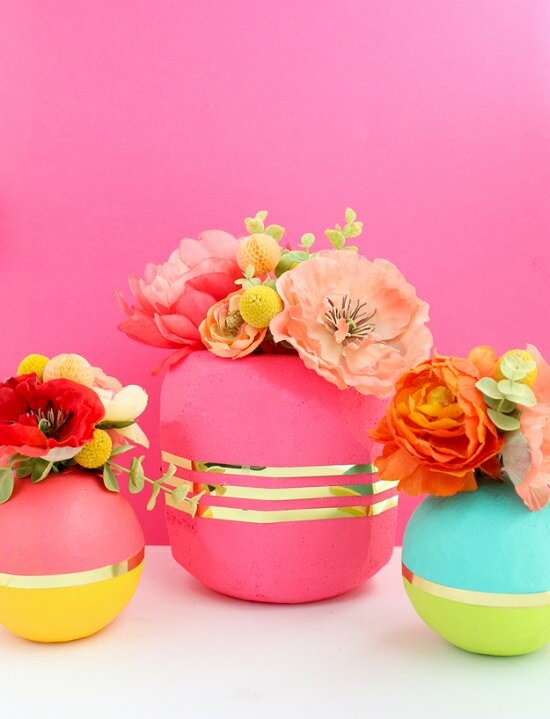 Manipulating colorful paper into sturdy flower vases lies at the core of this DIY. Get the details here. 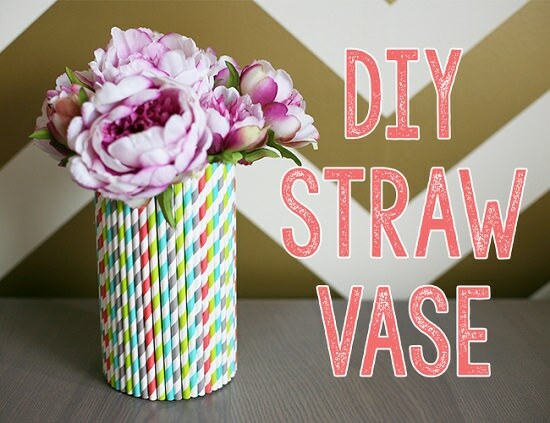 Instead of painting stripes on the vase, glue straws onto it for a dioramic look. We got the inspiration from here. 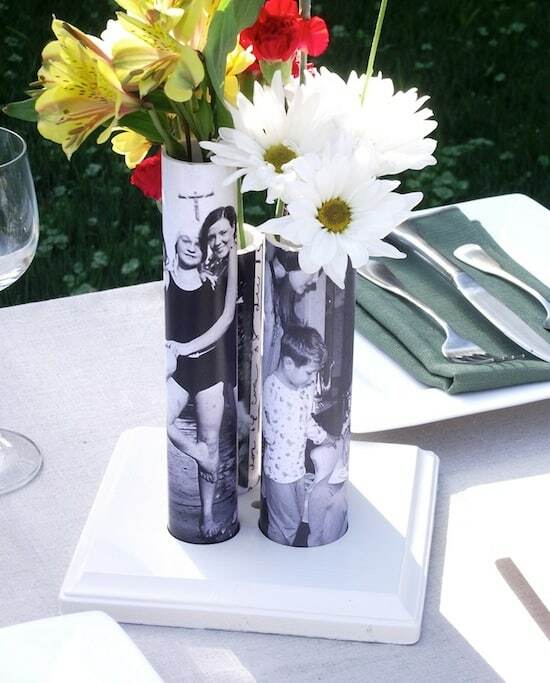 This DIY combined loving photos and PVC pipes into personalized mother’s day gifts.